As a young Chinese Studies student at the University of California Santa Cruz in the early 1970s, Kenneth struggled to find his place in the world. But he soon discovered the world of clay and began learning pottery under Al Johnsen. This was the beginning of his fascination with the great pottery traditions of East Asia, which continues to the present day. After graduation, Kenneth traveled to Taiwan to continue his study of Chinese and pottery. He subsequently returned to the U.S and began working out of a small pottery studio in Venice in Southern California. A series of events followed, including meeting his Japanese wife Hiroko Ozawa and learning Japanese, that led him to Japan where he got to know Yoshida Yoshihiko, a master potter in Gifu prefecture. Kenneth recalls that, “Among the dozens and dozens of potters that I had met in Tajimi, Yoshida seemed especially open-minded and rock-solid serious at the same time, and for me this seemed like a breath of fresh air.” So Kenneth began an apprenticeship with Yoshida in the mid-1980s that lasted almost three years. Yoshida is well known in Japan for his understated yet outstandingly beautiful work that is full of life and warmth. Yoshida taught Kenneth not to force things in his work or go to an extreme just to gain attention. While many potters aim to be original, Yoshida’s philosophy is that merely unusual work is nothing exceptional. 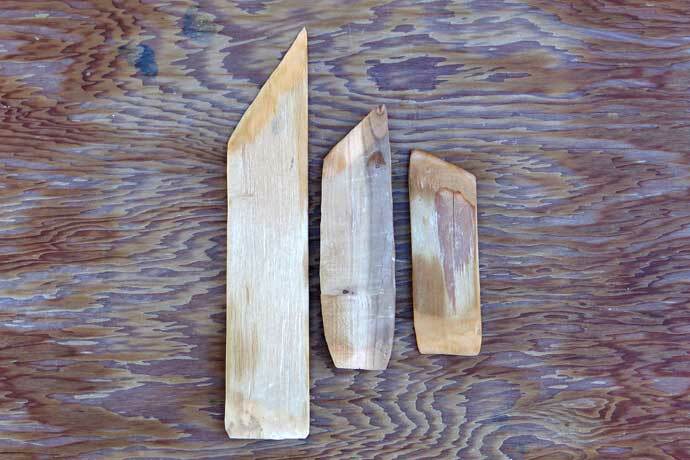 Wooden trimming knives that Kenneth learned to make from Yoshida. These knives are all handmade out of local wood and gives a distinct look to the trimmed clay surface. To Kenneth, using these wooden knives makes trimming a joyous challenge rather than a chore. Kenneth trimming a foot on a tea bowl. The distinct texture left on the clay is visible. Three decades on, Kenneth is still fully engaged with clay and approaches it each time with the eagerness and fresh eyes of a child. 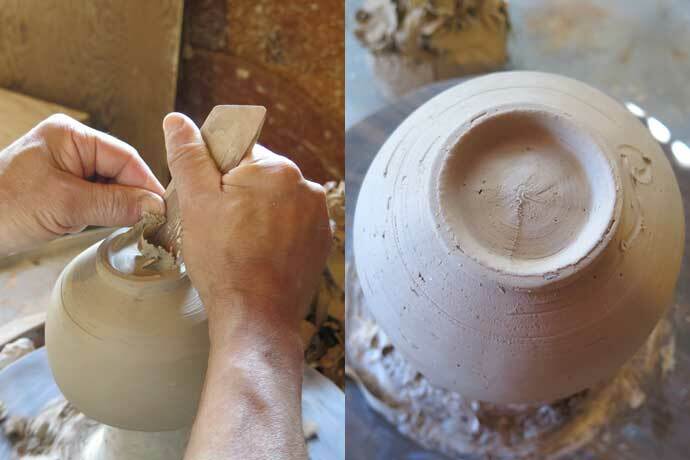 Most of Kenneth’s small pots are created on a kick-wheel by throwing off-the-hump, while his larger pieces are made on an electric wheel. He works in 1-2 month cycles of forming, throwing and trimming and then glazing and firing. At the start of every cycle, Kenneth cleans the studio, which is a meditative task that helps him to focus. By the time he sits at the wheel, he knows what form he is after. Kenneth uses both gas and wood kilns. 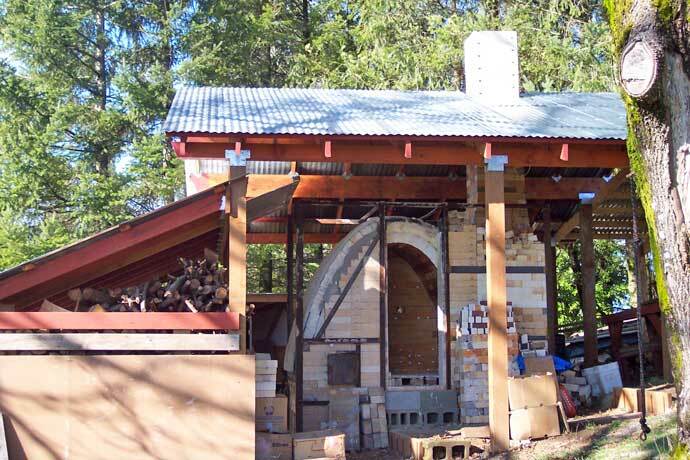 His wood-fired kiln is fired 2-3 times a year using a variety of wood from the local area: big leaf maple, Douglas fir, pine, alder, and different types of harder woods like cherry or oak. Even though it is hard work, wood-firing is rewarding for Kenneth because it inspires him to grow and be more adventurous with the clay. “There is always a balance between control and freedom, and the wood firing adds a big helping of the unexpected to my often limited efforts, and for this I am very thankful.” He also enjoys the special bond that the wood-firing process brings between the local potters because its preparation demands collaboration. Kenneth Pincus’ wood-firing kiln in the Skyline area of North West Oregon. Each firing lasts about 36 hours with 4 people working in half-day shifts. At first glance, Kenneth’s work might seem simple, but under its quiet surface there is so much vigor that invites the pieces to be picked up. “The crucial factor for me is that the clay is not overworked, that I throw the piece to the size and thickness it needs to be, and then stop. This is to say it’s important to know when to end the throwing as too much touching causes the form to lose its buoyancy and freshness” Kenneth observes. Wood-fired rice bowl by Kenneth Pincus. The flared shape has an air of sophistication and allows the bowl to be of multi-use. It also is easier to eat from. To me, what is so remarkable about Kenneth’s work is its energizing directness. 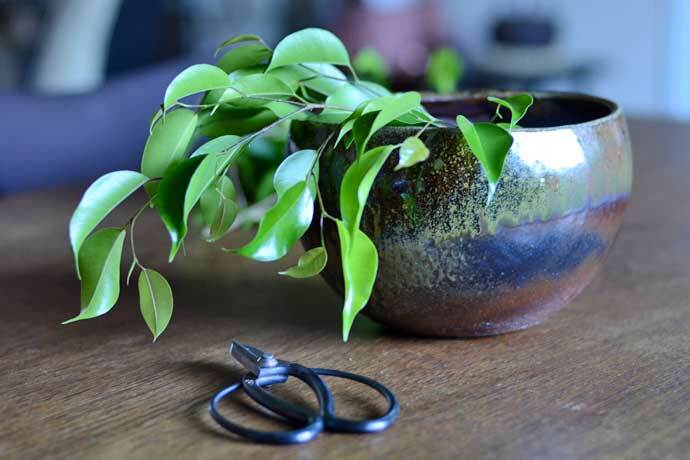 Be it a rice bowl or a cup, Kenneth’s pots are born to be used and they are alive with healthy beauty. 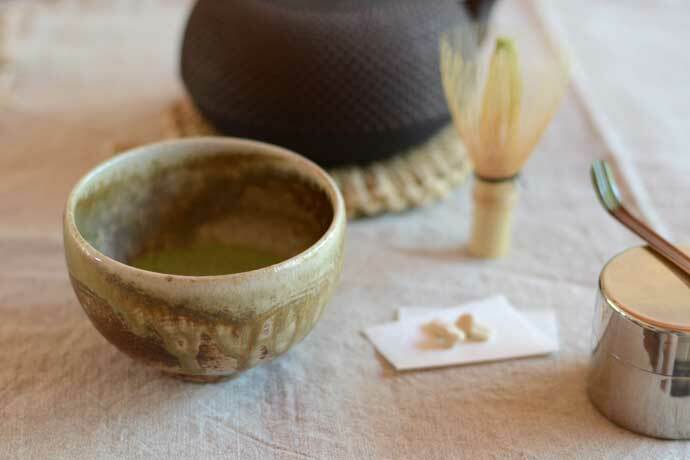 Making matcha in a wood-fired kiseto tea bowl by Kenneth Pincus is pure delight. The bowl is well-balanced and lovely to hold. 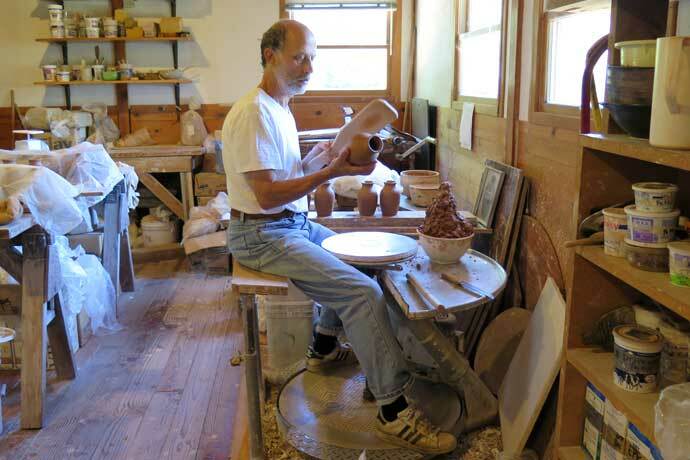 Kenneth’s long time friend and potter Bill Geisinger remarked that, “I use Ken’s pots everyday. 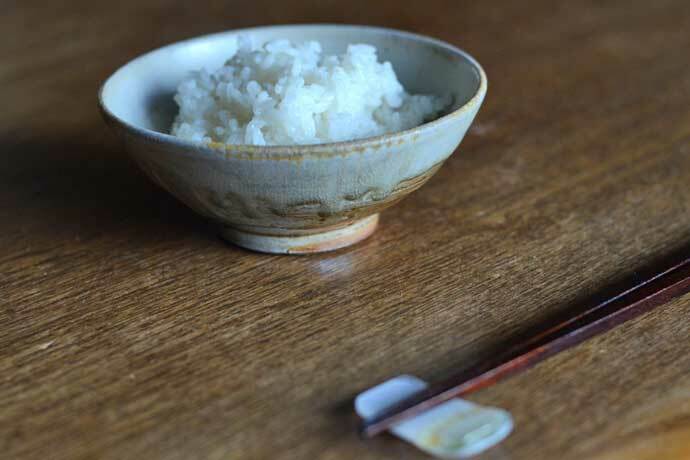 They are finely crafted with unique character that add beauty to my life!” My husband, who cares very little about pottery, uses Kenneth’s rice bowl everyday at dinner because “it feels good to eat from it”. Kenneth says he is thankful for his life as a potter, for the chance to play and to work hard. We are very fortunate that there is a potter like Kenneth Pincus creating beautiful work that can be interwoven with our practical lives, and become our true and constant companions.